Founded in 1884 by brothers António and Francisco Borges, Borges was originally a banking and tobacco business, but pretty quickly the brothers expanded into wine, with the establishment of a wine exporting arm in 1891. 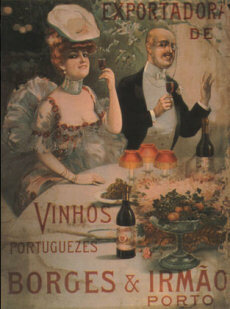 Since then, mainly through acquisition of established estates, the company has become one of the most important producers of wine in Portugal with a history that plots their expansion into many territories. In 1904 the company acquired its first estate in the Douro Valley (where its Douro wines are still made today), and in 1934 launched the Fita Azul sparkling wine brand that became a Portuguese best-seller. By 1970 the Dão region became an area of focus with their Meia Encosta range, adding yet another region to their portfolio in 1991 when they acquired the Quinta de Simaens estate in the Minho for the production of Vinho Verde. Their own estate in Dão followed, with the purchase of Quinta de São Simão da Aguieira in 1995 In 1998 the family firm of Borges was acquired by the Portuguese JMV Group, and today the company is fully integrated, from vineyard ownership through to consumer sales, with large state-of-the-art production facilities. The company recently got in touch with me and sent me a couple of sample bottles from their extensive range of brands and cuvées to taste for myself. Made by the traditional method, this is a white sparkling wine made from Touriga Nacional, so effectively a Blanc de Noir. 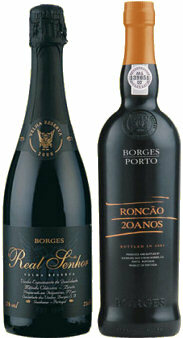 Grapes are sourced from various regions in Portugal, and the wine was aged on the lees for 36 months before release. This pours with a very pale colour and good stream of moderately small bubbles. The nose is fresh, a touch nutty, a touch herby, with some apple fruit character. On the palate there is a sweetness to this. The mousse if fairly modest, giving a gentle rolling effervescence, and the wine has a clean apple and pear fruit quality, maybe just hinting at peachy softness, but then plenty of acidity adds a tiny but enjoyable bitter twist to the finish. A simple wine, but balanced and enjoyable. 86-87/100. A typical blend of Touriga Franca, Touriga Nacional, Tinta Barocca, Tinta Roriz and Tinta Cão, vines are 30 to 40 years old, planted in the Douro’s slate soils. The residual sugar in the wine is around 110g/l, and alcohol 20% by volume. The colour is a fairly deep, ruby-tinged tawny, with dark aromas of rum-soaked raisins, coffee and walnuts, but a glimpse of something floral too, touches of rose and violet. In the mouth it is warming and rich, the walnut and dark, prune and raisin flavours are delicious and the spirit adds a background heat without being over-bearing. There’s a nice sense of freshness and energy to this, despite the mellow and harmonious flavours. 89-90/100.